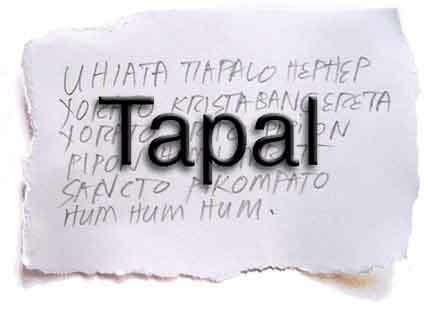 TAPAL is a common rural treatment modality that utilizes prayer, either written or whispered. A piece of common material, usually cloth or paper (ex: cigarette rolling paper) to which a prayer has been written (orasyon) is applied and pasted directly to the wound. The same prayer may also be whispered (bulong) onto the applied material and wound or area of complaint. Another common practice is to whisper the prayer on the top of the head hoping to drive the poison back or downward, away from the brain. Often used in the treatment of poisonous bites or wounds, it is also used for a lot of sundry complaints: fevers, headaches, toothaches, and arthritic pains, usually applied directed to the area of complaint. 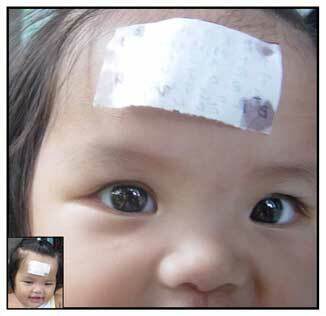 The above photo shows two "tapals:" one for right shoulder pains and another for a year-old "goiter" condition. The treatment involved both "bulong" and "orasyon," the prayer written on the pieces of paper now smudged and barely readable. Sometimes the prayer is written directly on the skin, "tintang intsik" is used, and bathing or washing of the scripted area is avoided for a few days.